View bottom, structure and fish swimming around and in front of your boat in real time with Garmin's Panoptix PS 31. Connected via the Garmin Marine Network the PS31 provides Forward and RealVü 3-D Forward views. Looking for the technology to see in front of your boat, Garmin’s Panoptix PS31 Forward Transducer is one option to be considered. Just pair the PS31 with your compatible Garmin unit and you have the ability to see fish, in real-time that are in front of your boat, when using the LiveVu Forward feature. You can actually see the fish swimming around your boat either to or away from you, you can even see your lure as you reel it in. When using the RealVu 3D Forward feature you get a picture of the bottom and fish in the water column in 3D coming to or going from the your boat. 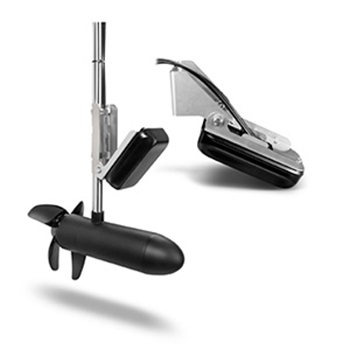 A trolling motor mount and transom mount kits are provided in the package giving the angler a choice to mount the PS31 Forward Transducer. Panoptix is like nothing you have seen before; it allows you to see fish that are all around your boat. The with the PS31 Panoptix transducer you can actually see the fish in the water column in 3D and then cast your bait to them and watch it as you reel it past the fish and even view a strike as it happens. The PS31 Panoptix transducer is truly revolutionary in the view it provides you under and around your boat. The PS31’s mount is made from stainless steel which should durability for years to come provided you follow the instructions published by Garmin. Compatible with: Garmin echoMap 70s, 70dv, GPSMAP 721/722/741/742/820/840/922/942/1020/1022/1040/1042/1222/1242 Series, 7600 and 7600xsv series, 8208, 8212, 8215 and 8500 & 8530 Black Box System via Garmin Marine Network. *Garmin GMS 10 Network Port Expander may be required for installation. See what Scott Martin, FLW 2015 Angler of the Year winner says about Panoptix! Each Garmin Panoptix PS31 comes with:PS31 forward looking transducer (integrated 30 ft network cable, 15 ft power cable), Trolling Motor Mount, Transom Mount, Split ring RJ45 connector, Software update microSD card with adapter, Documentation and a Two-Year Warranty.